Contrary to theories of single person authorship, America's Corporate Art argues that the corporate studio is the author of Hollywood motion pictures, both during the classical era of the studio system and beyond, when studios became players in global dramas staged by massive entertainment conglomerates. 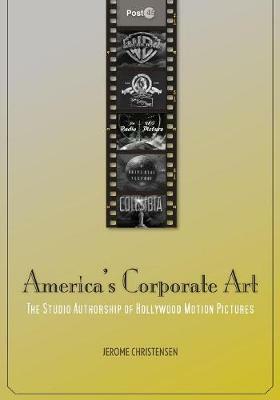 Hollywood movies are examples of a commodity that, until the digital age, was rare: a self-advertising artifact that markets the studio's brand in the very act of consumption.The book covers the history of corporate authorship through the antithetical visions of two of the most dominant Hollywood studios, Warner Bros. and MGM. During the classical era, these studios promoted their brands as competing social visions in strategically significant pictures such as MGM's Singin' in the Rain and Warner's The Fountainhead. Christensen follows the studios' divergent fates as MGM declined into a valuable and portable logo, while Warner Bros. employed Batman, JFK, and You've Got Mail to seal deals that made it the biggest entertainment corporation in the world. The book concludes with an analysis of the Disney-Pixar merger and the first two Toy Story movies in light of the recent judicial extension of constitutional rights of the corporate person.